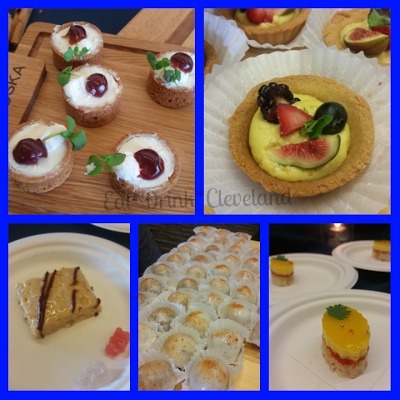 As I mentioned last week, this time of year is one of my favorites for food events in Cleveland. Some of the best fundraising events highlighting our area's chefs are in September! 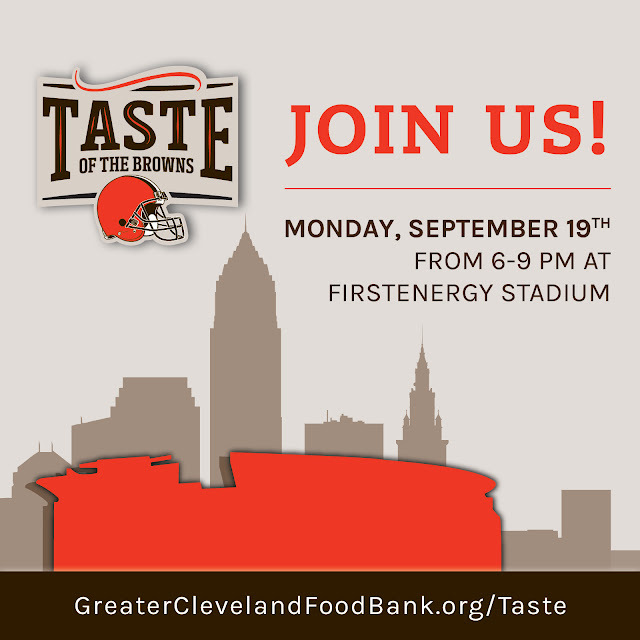 Including the Greater Cleveland Food Bank's annual Taste of the Browns at the stadium. 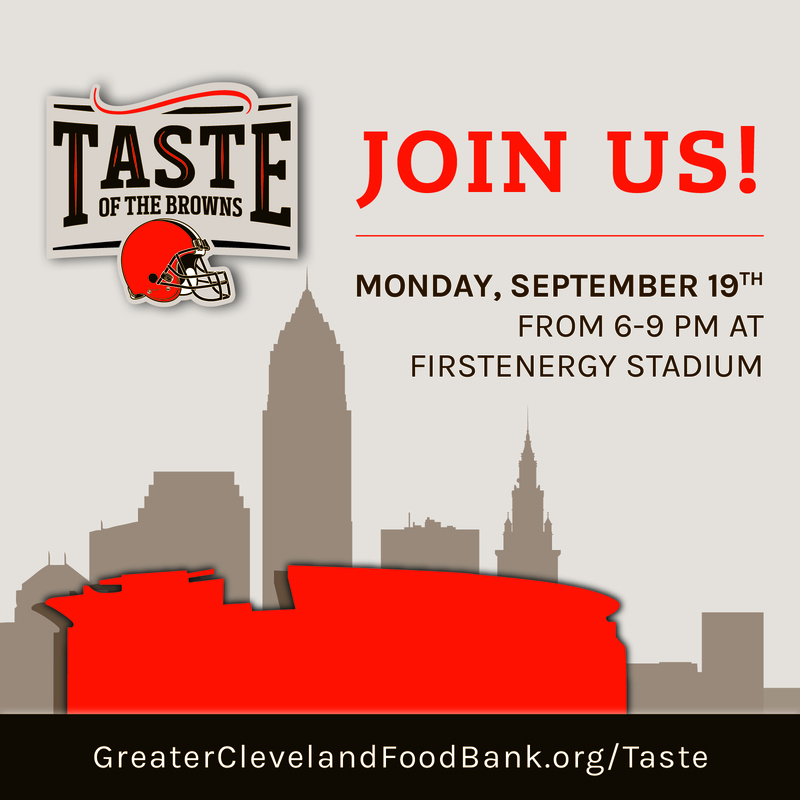 Celebrating 18 years of tackling hunger for Northeast Ohio families, Taste of the Browns returns to FirstEnergy Stadium on Monday, September 19. The event is the major annual fundraiser for the Greater Cleveland Food Bank, the region’s largest hunger relief organization. With the more than $224,000 raised at the 2015 event, the Food Bank was able to distribute more than 896,000 meals to agencies in six counties. I used to plan this event for the Food Bank when I first moved to Cleveland, and it's been amazing to see it just continue to grow. The funds it raises provides critical services to the community, and allows the Food Bank to continue to do more and more. This event, and organization, will always have a soft spot in my heart, since I started my non-profit career in Cleveland there. But, this event makes a fan out of everyone that attends. The event will be held in the Club Lounge at FirstEnergy Stadium. General admission tickets are available for $175, or VIP tickets are available for $250. The event also includes a silent and live auction, raffles, live music, and mingling with Browns' current and past players. For more information or to order tickets, call (216) 738-2046 or visit www.GreaterClevelandFoodBank.org/Taste. Or, you could walk away this week a lucky winner of two General Admission tickets. Just use the form below for multiple ways to enter the random giveaway. The winner will be announced on Friday. You can check out last year's review of this event here. Trust me, it's one that you don't want to miss! Good luck. Disclosure: I was provided with four tickets in exchange for this giveaway post and an event review. I am a former employee of the Food Bank. All opinions stated are 100% my own. Mr. H and I popped over to the Cleveland Garlic Festival for lunch yesterday. I love this small annual festival that benefits the North Union Farmers Market. There's something for everyone. Plenty of garlic varietals to shop for. We picked up a sampler pack of bulbs from Thaxton's Organic Garlic. There are also all sorts of garlic-based products to discover. We took home a roasted garlic jelly that I think is going to go well with several things. We also picked up a specialty garlic powder and some garlic scape flakes from Dragon Breath Gourmet Garlic (love the name!) to cook with. We already used the scape flakes by sprinkling them over eggs this morning! All kinds of activities are taking place. There are things for the kiddos, and then chef demos and a wine/beer tent for the adults. Also, you can munch on lots of garlic-based food. My favorite? The fresh-cut fries with garlic aioli from Cafe Avalaun. It's a "must-have" each year for me. Other stands are serving garlic fries, but skip right past those guys and head to this particular stand. You're in luck! The festival is two days long, and it's still happening today in Shaker Square from noon - 5PM. Go have some garlicky fun! Disclosure: I was provided with four weekend passes to this festival, in exchange for hosting a giveaway and this event recap. But, I truly enjoy this event every year and think that you should go. All opinions are 100% my own. September is chock full of great charity events highlighting our area chefs. Luckily, the one that I plan has moved to October this year. That leaves me just open and ready to enjoy the others for the first time! 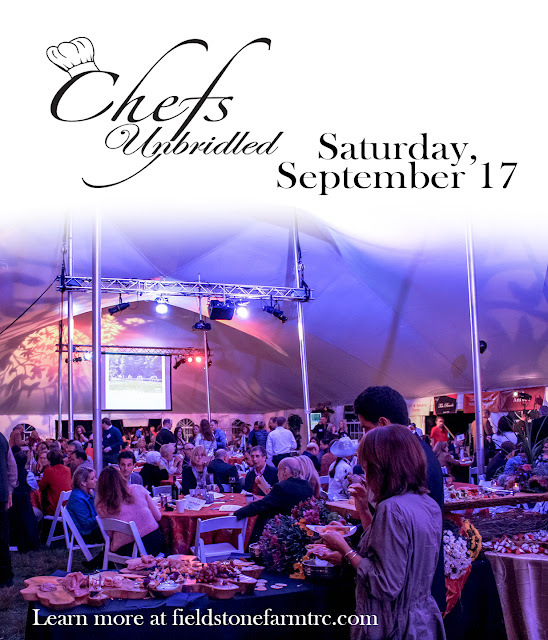 One that I'm looking forward to attending is the 2016 Chefs Unbridled. This top Cleveland-area benefit is slated for Saturday, September 17th at 6:00PM to benefit Fieldstone Farm Therapeutic Riding Center. 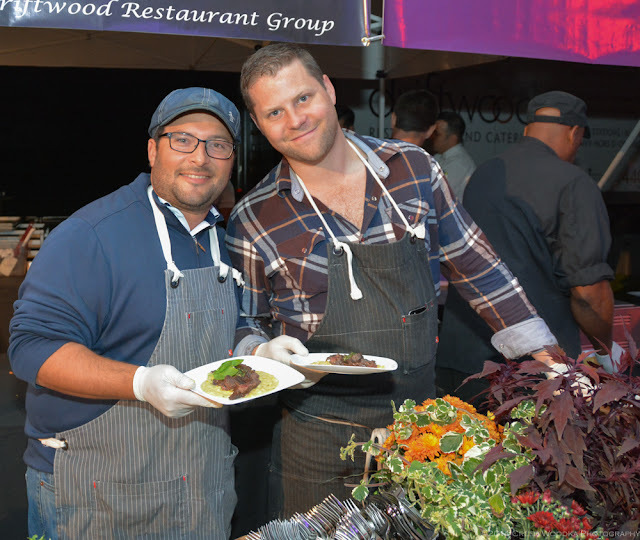 Leading Cleveland restauranteurs Scott Kuhn and Chris Hodgson of Driftwood Restaurant Group chair the event, and it always has a stellar chef lineup. Personally, I'm most looking forward to trying dishes from some of my favorites like BOLD, Graffiti, and Butcher and the Brewer. There will be the new-to-me Lemon Falls Cafe, and then Driftwood and Market have had some of my favorite food at this event in the past. Ok, my mouth is officially watering now. Taking place under a decorated tent on the grounds of the prestigious Chagrin Valley Hunt Club Polo Field, guests will enjoy cocktails and appetizers while sampling cuisine from various stations around the tent in addition to tasty treats from a food truck and a cupcake truck. The setting is what really makes this event stand out. New additions for the 2016 event include private vintner getaway packages in Sonoma or Napa Valley, as well as an exclusive Kentucky Bourbon Trail getaway experience, and a wine pull raffle. The evening will also feature live music, horse-drawn carriage rides throughout the historic district of the village, and a bourbon tasting with Tom’s Foolery. The event is Fieldstone Farm’s primary benefit to raise money for the Ridership Program to benefit riders with special needs. Fieldstone Farm serves students of all ages, including veterans, who face a variety of challenges, such as anxiety and PTSD, as well as people who have ADHD, blindness, depression, Down syndrome, injuries, multiple sclerosis, and neurological disorders, among other disabilities. Students work with the horses to overcome barriers and achieve goals such as independence, self-esteem, strength, and socialization. Serving more than 1,000 students each year, Fieldstone Farm is one of the largest centers of its kind in the country. Ticket prices begin at $140 and include a tax-deductible donation to Fieldstone Farm Therapeutic Riding Center. Tables and sponsorship packages are still available. Reservations for Chefs Unbridled can be made before September 1st (so don't wait! ); however seating is limited and the event sells out quickly each year. For tickets and details, visit the website www.fieldstonefarmtrc.com or contact Maureen Foster at 440-708-0013, ext. 123 or mfoster@fieldstonefarmtrc.com. Disclosure: I was provided with two tickets to attend the event in exchange for this preview post. All opinions stated are 100% my own. One last travel post that I think is worth sharing, because this Portland, Maine restaurant is such an interesting concept. One that Cleveland doesn't have. Hugo's in Portland (same owners as our favorite Eventide Oyster Company) defines themselves as "refined New England cuisine" and it features a daily tasting menu with 15 selections. There are three categories, and five courses within each category. For $90 (single courses are available for $22), diners select an option for each course from any of the categories. A build-your-own chef's tasting, and it reminded me of, the now closed, One Walnut in Cleveland. But, the really special thing about Hugo's is that the entire restaurant is a "chef's table experience," with front row seats to the open kitchen. Most of the restaurant's seating is at the bar, and you are literally watching the dishes be created right in front of you. It was captivating. Such pressure for the staff though! The food reminded me a lot of Cleveland's Trentina. The technique and skill level showcased was impressive, and the plating was gorgeous. There wasn't a course that we didn't enjoy. However, the flavors just didn't "wow" us. The food felt safe, flavor-wise. The experience was one to remember, being front and center for the meal and seeing their creative takes on familiar ingredients. I liked this restaurant concept, and it left me wishing that there was something in Cleveland like this. Chef's tables can be exclusive and expensive, and this place opened that experience up for every diner in the restaurant. Very cool. This was the second time that Mr. H and I have traveled to Maine, and it won't be our last. A quick flight in to Boston, and then driving up the coast checking out small town after small town...it's incredibly relaxing. And, delicious. I'm a seafood nut. I could live on seafood and fish. Although, I'd miss bacon, and a good steak. We've headed there at this time of year to attend the Annual Maine Lobster Festival. It's soft-shelled lobster season, and you can literally rip them apart with your hands. The annual festival includes food, games, crafts, rides, a parade, beer and wine tasting event, cooking competition, and more. It's a lot of fun, and we'll go back. We literally ate a lobster roll for lunch every day of the trip. Mr. H seemed determined to find the "best" one. I wasn't complaining. This trip, the "best" was definitely from Bob's Clam Hut in Kittery, ME. Red's Eats was a close second. Although, we still feel like the Connecticut style roll from Fisherman's Grill that we had last year is the top roll we've tried. And at this point, we've tried almost every roll from Boston to Belfast, ME that has made some sort of "top list" out there. I'm not ashamed. Every bite was heaven. We also feasted on oysters almost daily. Straight out of the sea, it doesn't get any better. Maine is a great 4-5 day trip from Cleveland, and I can't rave about it enough. Mr. H and I both walk away each time feeling relaxed and happy. As any vacation should leave you feeling. Our last restaurant stop in Pittsburgh worth sharing is Sunday brunch at Eleven. A rehabilitated warehouse tucked next to the railway lines, this spot is elegant and polished. For brunch, you can order a la carte, or do the Brunch Prix Fixe for $29. It includes an appetizer, entree, and choice of fresh juice or brunch cocktail. It was our last meal in Pittsburgh, so we splurged and wanted to try more dishes through the Prix Fixe. We did a bit of sharing. I ordered the Smoked Salmon with an everything bagel, egg, red onion, capers, and scallion cream cheese. A meal in itself! Reminded me of trips to NYC. I would have been happy with this dish alone. Mr. H's sweet tooth kicked in, and he ordered the Grilled Sticky with a cinnamon swirl brioche, bacon butterscotch, and icing. Sweet, but decadent, and I saved a tiny bite for the end of the meal. For his entree, Mr. H got the Smoked Lamb Huevos Rancheros with fried eggs, tomatillo salsa, goat cheese, and refried lentils. While I preferred my Eggs Benedict with an English muffin, hollandaise, truffle vinaigrette, prosciutto cotto, arugula, and citrus, his dish was good too. Why isn't prosciutto an option with Benedict more often? This was a splurge-worthy brunch in Pittsburgh, and a very popular spot. Check it out if you're in the mood for an upscale brunch. Next up on our Pittsburgh Eats excursions was lunch at Smoke BBQ Taqueria. The interior was bright and lively, with heavenly smokey smells coming from the kitchen and smoker. I couldn't resist the pork taco special that day. But, I also had to try their Brisket Taco with sauteed onions, hot peppers, and mustard BBQ sauce ($7.50). Both tacos were bursting with flavor, and subtle heat that lingered. I really liked both of them! Mr. H and I shared a side of their famous Mac & Cheese ($8.75). It was outstanding. Only Lucky's Cafe in Tremont would rank higher, in my opinion. This lunch was awesome, and I suggest that you check them out when in Pittsburgh. One of the events that I really look forward to each summer is the Cleveland Garlic Festival. The annual fundraiser for the North Union Farmers Market supports their weekly markets throughout the year in Greater Cleveland. This includes Food Stamp enhanced purchases/EBT-SNAP, Music at the Market, Chef at the Market, and the Mighty Locavores K-2 educational programming in Cleveland Municipal School District, just to name a few of the programs this event supports. Mr. H and I try to get to it every year. Maybe it's because my dad HATES garlic and I love to taunt him with photos, or the great chef demos and new garlic-based products we find each time, but either way, we always enjoy ourselves. This year's event is taking place on Saturday, August 27, 2016 from Noon to 9pm, and Sunday, August 28, 2016 from Noon to 6pm in Shaker Square. You can purchase tickets here. Or, you can win two Weekend Passes right here. The giveaway will end on Friday. a Rafflecopter giveaway The event includes all sorts of vendors, chef demonstrations, live music, parades, activities, and more. Get ready for some garlicky goodness! Disclosure: I was provided with four weekend passes in exchange for this blog post. All opinions stated are 100% my own. I mentioned that I've been traveling for work a lot recently, and the first trip took me to Pittsburgh. Mr. H and I decided to make it a weekend getaway, and he went with me. Of course, that meant checking out some of Pittsburgh's fabulous eats. So, I wanted to share a few with you this week. We popped in to Meat and Potatoes for a cocktail and appetizers early on Friday evening. These bartenders sure know their craft cocktails! We shared the Fried Pig Ears with sweet Thai chili sauce ($8) and the Buttermilk Fried Chicken Livers with chipotle remoulade ($7). Both were fantastic, and probably the best food I had in Pittsburgh. So good, that Mr. H went back there the next night for dinner on his own, while I attended a work function. This spot reminded me a lot of The Black Pig in Cleveland. Then we headed a few blocks over to Butcher and the Rye. The atmosphere reminded me a lot of The Greenhouse Tavern in Cleveland. We just couldn't resist trying the Dry Aged Tartare with Parmesan crusted bread, black garlic aioli, truffle egg, radish, and capers ($16). I loved the presentation, and it was a tasty preparation of tartare. For my entree, I ordered the Pan Seared Halibut with toasted almond gnocchi, artichoke, raisin and olive marmalade, and burnt lemon curd ($29). It was good, but not great. The presentation was sloppy, and it didn't pack a lot of flavor. I also wished that there were more gnocchi on the plate. Overall, these were two good restaurants, and ones that I'd recommend checking out in Pittsburgh. Hello, strangers! I know that it's been quiet over here lately. The last three weeks have included two work trips, and a long weekend getaway to Maine for Mr. H and I. It's been fun, but I'm exhausted, and ready to be home. Today, I have a guest post for you. While I was in Maine, my good buddy Crystal attended the bi-annual Chef Gala to benefit Autism Speaks for me. She's popping in today to tell you all about it. 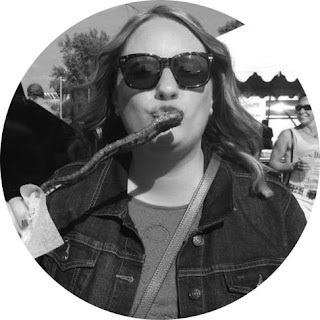 This is Crystal from Eat*Drink*Cleveland and I’m stopping by to tell you about a great event I went to recently. Because my dear friend Bite Buff was out of town eating all the lobster, and she knew I recently moved (and desperately needed a fun night out on the town! ), she graciously offered me her tickets to the Autism Speaks Chef Gala. Let’s just say, it was just what I needed! This is one of the best fundraisers in CLE hands down. 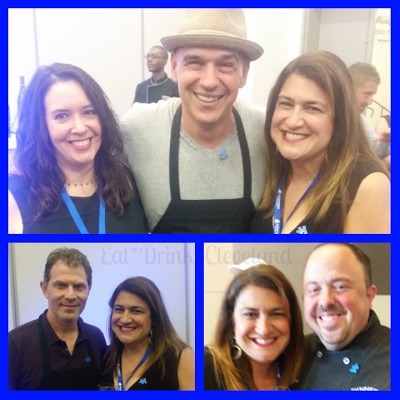 Where else can you sample over the top delicious food from our very best local chefs AND also get up close in personal with Michael Symon and his out of town chef friends. This year, Chef Symon brought his friend Bobby Flay. What a fun combo they make! We made it our mission to try everything and we actually succeeded. We were smart and shared samples at a lot of the stations. There was so much food and all of it was delicious! My favorite bite of the night was the Pork Rind Crispy Treats from Jonathan Sawyer. They sounded a little weird but they were amazing! Huge points for creativity too. Then everyone headed to the ballroom for a seated chef demo. Bobby Flay and Michael Symon cooked up a storm and we were given family-style platters of food to try as well. We somehow managed to taste all of these dishes, but barely. We were completely stuffed. 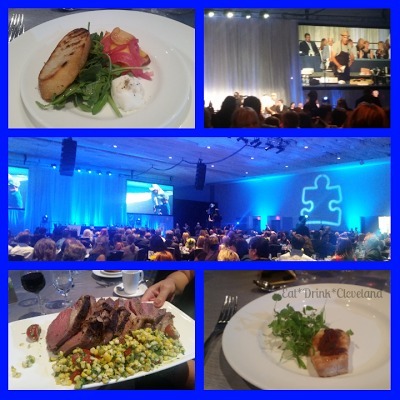 During the meal we learned a lot about Autism Speaks, they raffled off seats on stage and there was a live auction. They also included a very moving tribute to the late co-founder of the organization, Suzanne Wright. The best part - $300,000 + was raised for Autism Speaks. In two years, this amazing event will be back – make sure you don’t miss it when it does. But you don’t have to wait until then to support this very worthwhile cause. Click here to donate and you can follow them on Facebook too. Thanks again to Bite Buff for the opportunity to attend this event and share my thoughts with all her awesome readers. This was one event that I hated to miss, but the Maine trip was worth it. 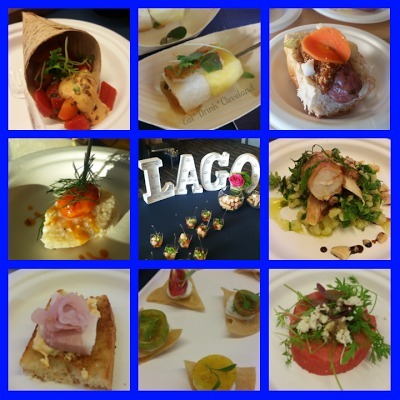 I also enjoyed drooling over the Chef Gala posts on social media that evening. The event highlighted some of Cleveland's finest, and raised funds for an important cause. Thanks for stepping in for me, Crystal, and I'm glad that you enjoyed the much-deserved night out! Disclosure: I was provided two VIP tickets in exchange for this post and a ticket giveaway, and two General Admission tickets for one lucky reader. All opinions stated are 100% Crystal's.